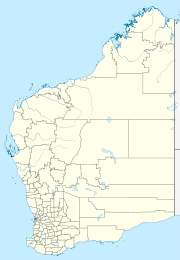 Bobieding is a small Aboriginal community, located 120 km north of Broome in the Kimberley Region of Western Australia, within the Shire of Broome. The Bobieding Community is named after a local fresh spring water hole called Bobbies Spring. Bobieding consists of members of an extended family and was founded by Mr Phillip Cox, community elder. The community is located within the Registered area of the Bindunbur (WAD359/2013) Native Title. The community is managed through its incorporated body, Bobieding Aboriginal Corporation, incorporated under the Aboriginal Councils and Associations Act 1976 on 26 August 1988. Bobieding Layout Plan No.1 has been prepared in accordance with State Planning Strategy 3.2 Aboriginal Settlements. Layout Plan No.1 was endorsed by the community on 1 August 2003, and by the Western Australian Planning Commission (WAPC) on 24 February 2004. This page was last edited on 11 June 2017, at 16:02 (UTC).